The historic Chicago theaters of downtown are must-see sites, but here are 6 off-Loop theater venues that tell their own curious tales of gangsters, immigrants, religion and outcasts. 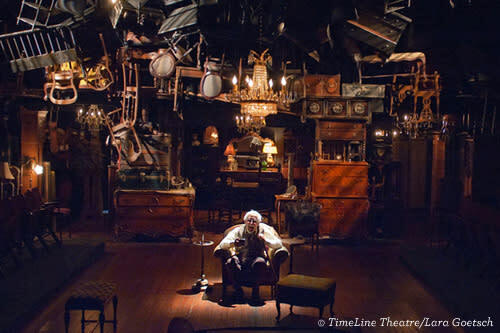 On and off stage, Chicago theatres are full of drama and beauty. Their venues vary from lavish to cozy, reflecting the eclecticism of the Chicago theatre tradition. Since the 1800s Chicago&apos;s theatre venues have been applauded for their architectural innovation and vibrant pasts. Most locals are familiar with historic downtown Chicago theaters and their past lives as extravagant movie houses in the early 1900s with astounding architecture like The Chicago Theatre and Oriental Theatre. Others might know about The Civic Opera House, the current home of the Lyric Opera and The Auditorium Theatre of Roosevelt University&apos;s crusades in architectural innovation during the late 1800s with designs that were democratic, safe, and the first of their kind. Some of Chicago&apos;s most interesting historic theater spaces, however, are off the beaten path and come with a history that is as fascinating as the stories told on their stages. These six off-loop Chicago theater venues tell stories of gangsters, immigrants, religion, and outcasts. Then: The year was 1934. John Herbert Dillinger, Public Enemy No. 1, was unsuspectingly seeing a movie at the The Biograph Theatre. On the sidewalk after the show, Melvin Purvis and Samuel P. Cowley of the FBI identified themselves and a shootout began. Dillinger, one of the high-status bank robbers in American History was pronounced dead that night on July 22, 1934 at 10:40 p.m. 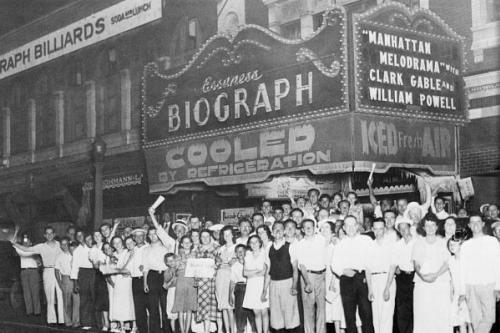 The Biograph Theater served as a popular storefront movie house for Chicagoans through the depression, two world wars, and two decades following. The morning after Dillinger was killed, the public gathered to cheer in front of the Biograph, the place of his death. The woman in this picture holds up the news article that reads "Dillinger Slain." Now: After The Biograph&apos;s closing in the 1970s, Victory Gardens Theater purchased and renovated the space with the help of architect Daniel P. Coffey in 2004. This location currently houses their two stages. In March of 2001, The Biograph was named a Chicago Landmark. Then: In the 1880s when the Lakeview neighborhood was establishing itself as more than just a farmland, German, Polish, and Irish Chicagoans requested a place of prayer prompting the opening of St. Alphonsus Catholic Church. When its prolific pastor, Fr. George Thomas responded to his parishioner&apos;s need for a safe recreational space and stage for their favorite touring operas, the Athenaeum opened in November 1911. The center included a gymnasium, four bowling allies, an assembly hall, and various meeting rooms. The Athenaeum Theatre was built as a venue to host the immigrant residents of Lakeview&apos;s favorite German operas. Now: Today, several arts organizations are building partners at the Athenaeum including Eclipse Theatre Company, Congo Square Theatre, Promethean Theatre Ensemble, Emerald City Theatre, Interrobang Theatre Project, and many more. In addition to theatre programming, Athenaeum houses The Lakeview Pantry in the former bowling alley and the adjacent convent now serves as a residency for former homeless women. Athenaeum is currently the oldest continuously operating off-loop theatre. Then: 1918, The Polish Triangle —or Wicker Park as we know it today — is where over two million Polish immigrants found home and community. The neighborhood was characterized by large churches, some of the largest Polish organizations, bakeries, and a Nickelodeon on 1543 West Division Street. The Nickelodeon, which opened in 1918 was used as a hang-out place with a basement pool table and movies upstairs. During the war, Liberty Bonds were sold at the Box Office. The Chopin is known for its eclectic interior. Pictured is the main entrance and the Pregnant Buffalo Lounge. Now: By the late 1970s the Nickelodeon had been abandoned, marked by bullets on the building&apos;s façade and a changed community. Zygmunt Dyrkacz, a Polish immigrant, was inspired by the neighborhood&apos;s history and reopened it as the Chopin Theatre in 1990. The theatre presents a variety of experimental European work true to its roots, serves as home to The House Theatre of Chicago and sees performances by dozens of theatre, music, and dance companies around Chicago and the world. 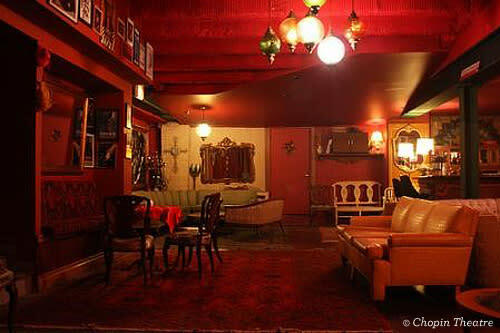 It&apos;s recognizable for its eclectic interior and was voted "a Chicago venue that matters" in 2010 by the Chicago Tribune. Then: In 1967, The Second City purchased a former Chinese laundromat for $6,000 on Wells Street in Piper&apos;s Alley, a funky collection of shops and restaurants in the Old Town neighborhood. It was the hippie hangout of Chicago; many calling it Chicago&apos;s answer to Greenwich Village. Perhaps the most historic part of Second City&apos;s space, however, is the carving of four men on its façade. This exterior architecture was taken from the second floor balcony of the torn-down historic Schiller Theatre (later the Garrick Theatre), a 17-story building that was built in 1892 as an envisioned home for a German opera company. 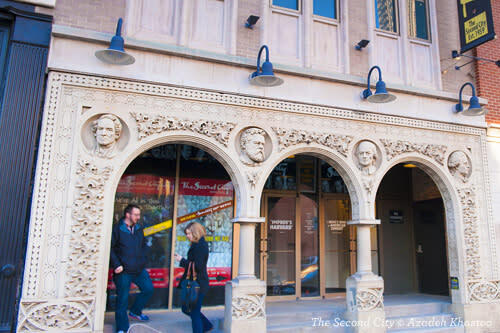 The four busts on the exterior of The Second City are accepted to be significant German cultural figures: composer Giacomo Meyerbeer, novelist Fritz Reuter, composer Wolfgang Amadeus Mozart, and writer/art critic Gotthold Ephraim Lessing. These carvings at The Second City are The Garrick Theatre&apos;s only remains. 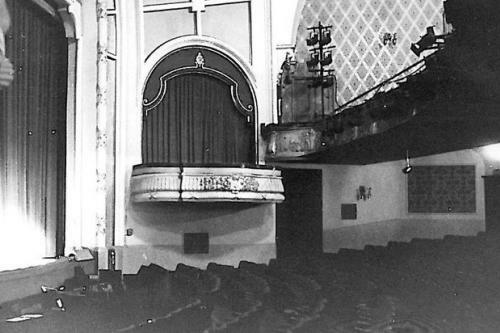 Garrick Theatre (previously the Schiller Theatre) in 1961. Now: The Second City is still the proud owner of its space on Wells Street. The building includes the 1959 Kitchen and Bar, as well as a Training Center, UP Comedy Club, their Mainstage Theatre, e.t.c. Theatre, and their administrative offices. 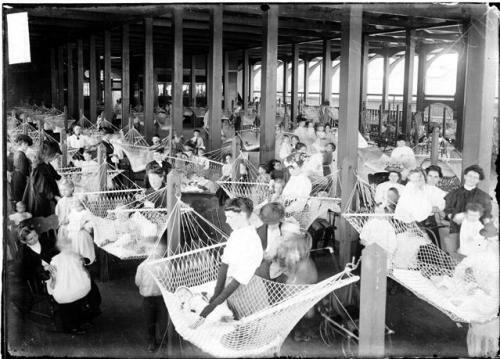 Then: Designed in 1913 and opened in 1920, the Chicago Daily News Fresh Air Fund Sanitarium funded this fresh-air charity that gave free healthcare and full lunches to over 30,000 children and infants each summer. The project was geared towards children who lived in heavily polluted downtown Chicago and families who could not afford healthcare. In addition to their great contribution to the community, their building was praised for its modern design by Dwight H. Perkins, who designed Café Brauer and the Lincoln Park Zoo&apos;s Lion House. After the Sanitarium&apos;s closing in 1939, the space served as a recreational center for The United Service Organization during World War II. Chicago Daily News Fresh Air Fund Sanitarium operated from 1920 to 1939. Now: In 1953, the Chicago Park District reopened the venue as Theater on the Lake. Since then, it has remounted audience-favorite productions each summer. While the space has been closed for reconstruction, Theater on the Lake has taken their programming "on the road" to parks around the city. Renovations are expected to be finished and ready for reopening in summer of 2017. Then: From church to theatre to absurdist theatre about church. Baird Hall, Wellington Avenue United Church of Christ&apos;s second floor rec room, was a place for cultural events and performances for the Lakeview community since its opening in 1910. In the 1960s, Wellington Avenue Church of Christ received a Community Arts Foundation grant to create a conversation between the arts and religion. The grant brought in The Chicago City Players, an existential avant-garde theatre company. Many members of the ensemble were also members of the church and Reverend James Kidd, the church&apos;s minister, often led post show talk-backs on the performances&apos; major themes. Baird Hall is now a convertible black box theatre used by TimeLine Theatre. Mike Nussbaum in TimeLine&apos;s 2016 production of The Price is pictured above (photo: Lara Goetsch). Now: From the 1970s through 1990s, the space went through a handful of edgy theatre creators and, since 1999, TimeLine Theatre Company has been its primary tenant, using Baird Hall for performances and renting from the Church to house their administrative offices and a multi-purpose rehearsal space. Visit ChicagoPlays.com to see what exciting productions are on stage while you&apos;re here, and if you&apos;re looking to get the inside scoop on what&apos;s happening across the city, get theatre recommendations from the Chicago Like a Local blog. Plus, check out Hot Tix for half-price theatre tickets to shows in Chicago.